PROTECTOR DE PANTALLA CRISTAL TEMPLADO 0.33MM PARA SONY XPERIA Z. La garantía de devolución está especificada en la parte más abajo del anuncio sujetas a las condiciones de venta de nuestra web. Tarjeta de Crédito o Débito. El protector de pantalla CRISTAL TEMPLADO tiene sólo 0.3mm. de espesor. Protector de alta calidad para SONY XPERIA Z C6602/C6603, fabricado en autentico cristal con bordes redondeados y un ancho especial de 0,3mm. 18x Savvies® SU75 Protector de Pantalla para Sony Xperia Z C6602 C6603. Savvies UltraClear Protector Pantalla para Sony Xperia Z C6602 C6603: Alta transparencia, protección contra arañazos, fáciles de montar. 6x Savvies® SU75 Protector de Pantalla para Sony Xperia Z C6603 (Trasero). Savvies UltraClear Protector Pantalla para Sony Xperia Z C6603 (Trasero): Alta transparencia, protección contra arañazos, fáciles de montar. 6x Savvies® SU75 Protector de Pantalla para Sony Xperia Z C6602 C6603. Savvies UltraClear Protector Pantalla para Sony Xperia Z C6602 C6603: Alta transparencia, protección contra arañazos, fáciles de montar. BROTECT® AirGlass® Protector Pantalla de Cristal Vidrio para Sony Xperia Z C6603 (Trasero). BROTECT® AirGlass®, el Protector de Pantalla de Cristal Vidrio Premium: el colega Extra-Duro y Ultra-Ligero para tu Sony Xperia Z C6603 (Trasero)! BROTECT® AirGlass® Protector Pantalla de Cristal Vidrio para Sony Xperia Z C6602 C6603. BROTECT® AirGlass®, el Protector de Pantalla de Cristal Vidrio Premium: el colega Extra-Duro y Ultra-Ligero para tu Sony Xperia Z C6602 C6603! 2x BROTECT® Matte Protector de Pantalla para Sony Xperia Z C6603 (Trasero). Una capa adhesiva recién desarrollada permite un fácil montaje del. Una instalación sin burbujas y sin problemas. ¡Te vas a sorprender! 2x BROTECT® HD-Clear Protector de pantalla para Sony Xperia Z C6603 (Trasero). 2x BROTECT® HD-Clear Protector de pantalla para Sony Xperia Z C6603 (Trasero) (2x Parte trasera). Los arañazos lo tienen muy difícil con este Protector de Pantalla. 2x BROTECT® Matte Protector de Pantalla para Sony Xperia Z C6602 C6603. Una capa adhesiva recién desarrollada permite un fácil montaje del. Una instalación sin burbujas y sin problemas. ¡Te vas a sorprender! 2x BROTECT® HD-Clear Protector de pantalla para Sony Xperia Z C6602 C6603. 2x BROTECT® HD-Clear Protector de pantalla para Sony Xperia Z C6602 C6603 (2x Parte delantera). Los arañazos lo tienen muy difícil con este Protector de Pantalla. Protección de privacidad a partir de un ángulo de 30 grados. Protección de la Privacidad. Protección de la privacidad. El adhesivo de silicona avanzada garantiza una instalación fácil sin burbujas, así como una perfeta adherencia. 3x Vikuiti™ Protector de Pantalla DQCT130 de 3M™ para Sony Xperia Z C6603 (Trasero) (3x Parte trasera). La superficie de la lámina para Sony Xperia Z C6603 (Trasero) es transparente y brillante como el cristal. 3x BROTECT® AirGlass® Protector Pantalla de Cristal Vidrio para Sony Xperia Z C6602 C6603. BROTECT® AirGlass®, el Protector de Pantalla de Cristal Vidrio Premium: el colega Extra-Duro y Ultra-Ligero para tu Sony Xperia Z C6602 C6603! Sony Xperia Z L36h C6603. Compatible Model:-Sony Xperia Z L36h C6603. Genuine Tempered Glass Film Screen Protector For. 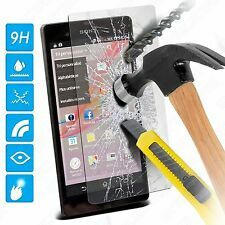 This 9H Hardness Rated Tempered Glass Screen Protector Effectively Protects The Screen From Scratches And Shocks. This Anti Shock Film screen protector fits Sony Xperia Z C6603 is a must-have for anyone prone to constantly dropping their phone. The screen protector fits perfectly fits over the Sony Xperia Z C6603 to prevent scratches and absorb shocks. SONY XPERIA Z C6602 C6603 only. Far superior to using glue. Very simple to remove residue adhesive & replace with new adhesive. BROTECT® AirGlass® Glass Screen Protector for Sony Xperia Z C6602 C6603. BROTECT® AirGlass® Premium Glass Screen Protector, the Extra-Hard and Ultra-Light sidekick for your Sony Xperia Z C6602 C6603! BROTECT® AirGlass® Glass Screen Protector for Sony Xperia Z C6603 (Back). 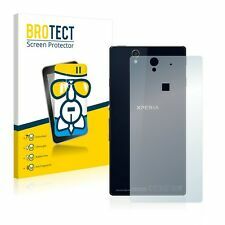 BROTECT® AirGlass® Premium Glass Screen Protector, the Extra-Hard and Ultra-Light sidekick for your Sony Xperia Z C6603 (Back)! Privacy Protection. Privacy protection starts at a 30° angle. Paste link into a browser window:[isdntekvideo]. The multitouch optimized surface preserves the original touch experience of your device. 3x BROTECT® AirGlass® Glass Screen Protector for Sony Xperia Z C6602 C6603. BROTECT® AirGlass® Premium Glass Screen Protector, the Extra-Hard and Ultra-Light sidekick for your Sony Xperia Z C6602 C6603! 2x BROTECT® Matte Screen Protector for Sony Xperia Z C6603 (Back). BROTECT® Matte Screen Protector for Sony Xperia Z C6603 (Back)- Matte and anti-glare, anti-scratch, anti-fingerprint, easy to apply and residue-free removable. 2x BROTECT® Matte Screen Protector for Sony Xperia Z C6602 C6603. BROTECT® Matte Screen Protector for Sony Xperia Z C6602 C6603- Matte and anti-glare, anti-scratch, anti-fingerprint, easy to apply and residue-free removable. 18x Savvies® SU75 Screen Protector for Sony Xperia Z C6602 C6603. Savvies UltraClear Screen Protector for Sony Xperia Z C6602 C6603: Crystal-Clear, easy application, excellent price quality ratio. The Savvies® SU75 UltraClear screen protectors are manufactured in Germany with the latest high-precision laser machinery. Matte and Anti-Glare. The matte surface reduces light and sun reflections on your screen. Attach screen protectors without bubbles of air - protectionfilms24 - YouTube. The multitouch optimized surface preserves the original touch experience of your device. 2x BROTECT® HD-Clear Screen Protector for Sony Xperia Z C6602 C6603. BROTECT® HD-Clear Screen Protector for Sony Xperia Z C6602 C6603- Crystal-clear, hard-coated, anti-fingerprint, easily mountable and removable. 2x BROTECT® HD-Clear Screen Protector for Sony Xperia Z C6603 (Back). BROTECT® HD-Clear Screen Protector for Sony Xperia Z C6603 (Back)- Crystal-clear, hard-coated, anti-fingerprint, easily mountable and removable. 6x Savvies® SU75 Screen Protector for Sony Xperia Z C6602 C6603. Savvies UltraClear Screen Protector for Sony Xperia Z C6602 C6603: Crystal-Clear, easy application, excellent price quality ratio. The Savvies® SU75 UltraClear screen protectors are manufactured in Germany with the latest high-precision laser machinery. Vikuiti™ screen protector CV8 for Sony Xperia Z C6602 C6603: Ultra clear and highly adhesive, hard-coated, residue-free removal. The film surface can easily be cleaned in most cases with a dry cloth. 6x Savvies® SU75 Screen Protector for Sony Xperia Z C6603 (Back). Savvies UltraClear Screen Protector for Sony Xperia Z C6603 (Back): Crystal-Clear, easy application, excellent price quality ratio. The Savvies® SU75 UltraClear screen protectors are manufactured in Germany with the latest high-precision laser machinery. Vikuiti™ screen protector CV8 for Sony Xperia Z C6603 (Back): Ultra clear and highly adhesive, hard-coated, residue-free removal. The film surface can easily be cleaned in most cases with a dry cloth. Vikuiti™ MySafeDisplay Screen Protector DQCT130 from 3M™ for Sony Xperia Z C6603 (Back): crystal-clear, hard-coated, dirt-repellent, easily mountable, easily removable. An optimised adhesive layer ensures an easy-to-apply, bubble free application of the Vikuiti™ screen protector DQCT130 for Sony Xperia Z C6603 (Back).